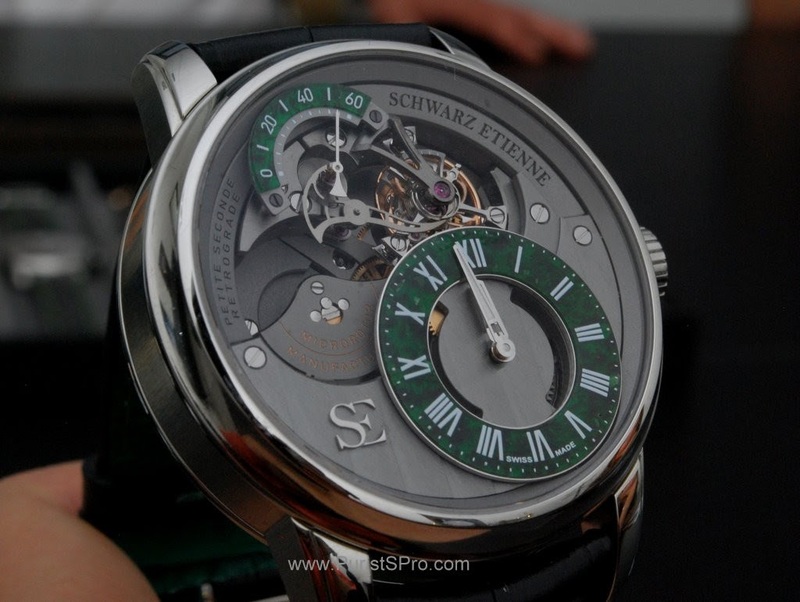 Schwarz Etienne is a watch manufacturer that may be unknown to you, but they have the potential to be an important player in the near future. 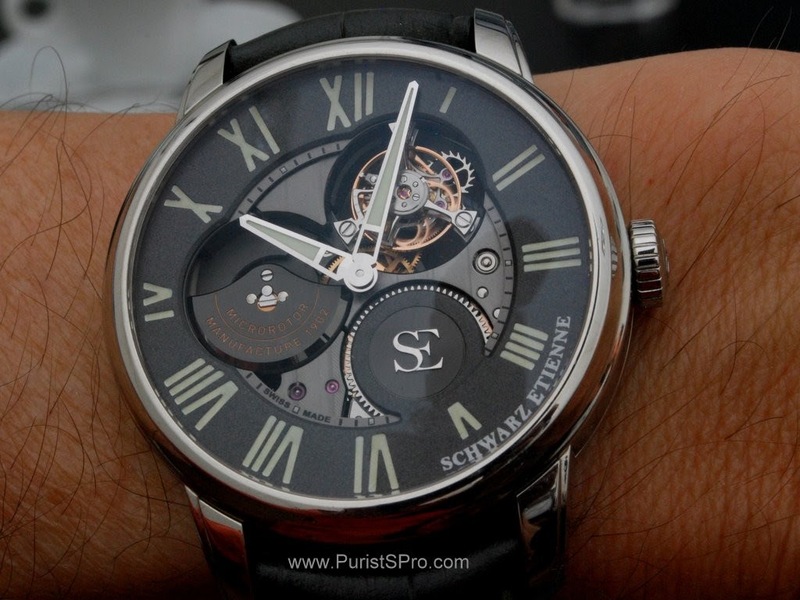 Schwarz Etienne is actually no stranger in the watch industry, founded as they were in 1902 by Paul Arthur Schwarz and his wife Olga Etienne, they were for most of their history movement suppliers to many of the big brands. 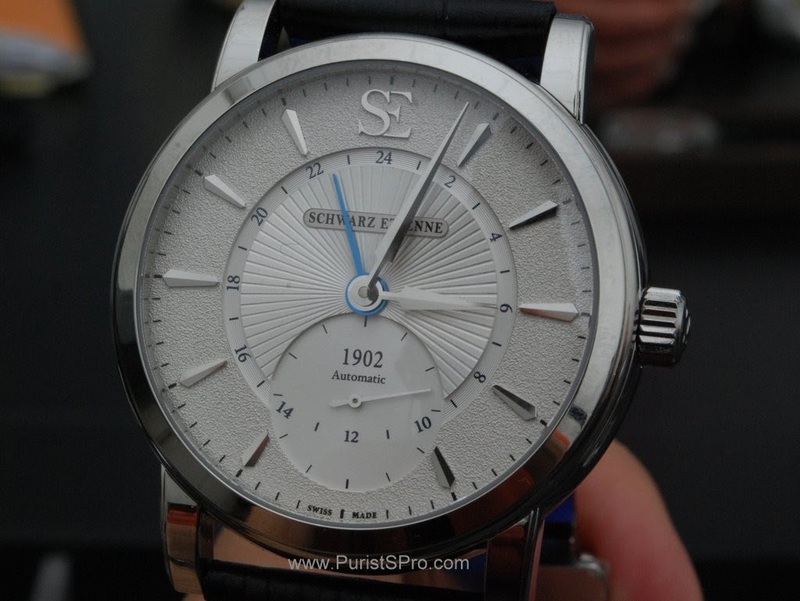 Under new ownership for the last 10 years they have a series of new movements and watches sold under their own name. 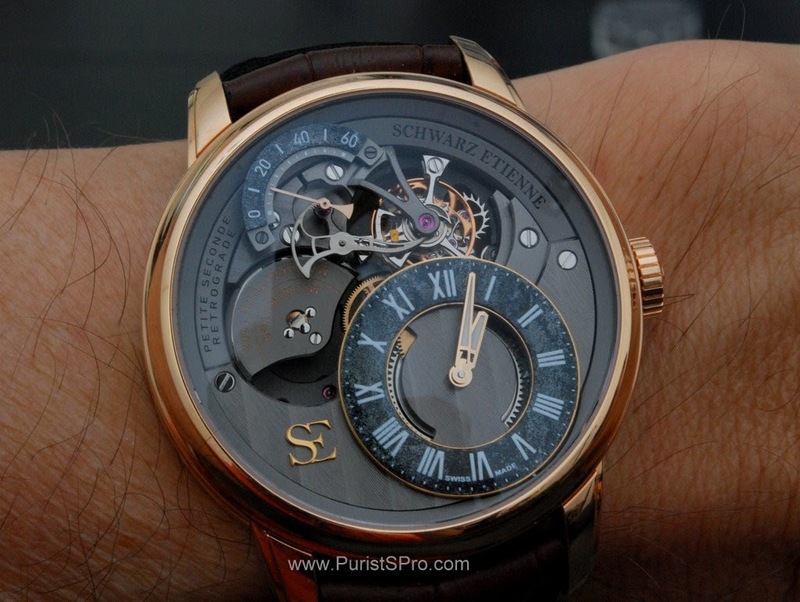 Here we see the retrograde small seconds flying tourbillon from the La Chaux-de-Fonds collection in rose gold. 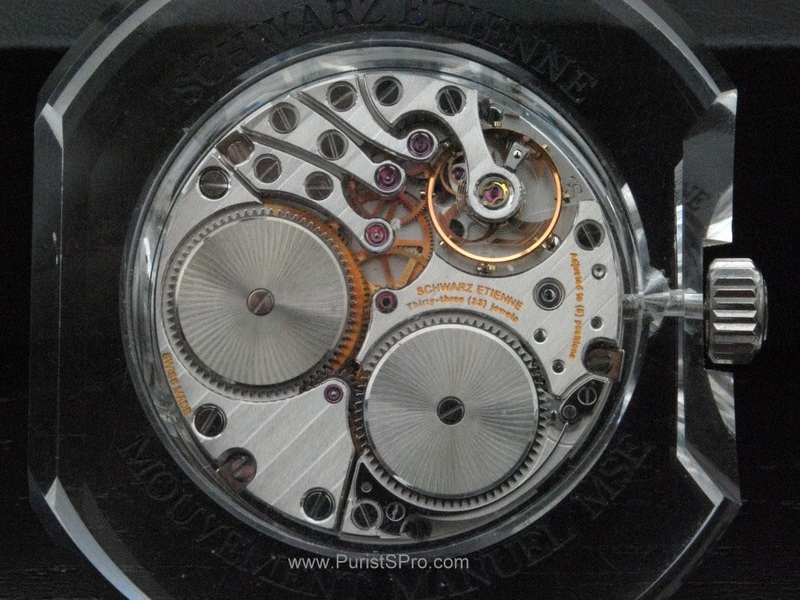 But that which makes them unique is that they are among the very very rare movement manufacturers who make their own escapements and most importantly hairsprings. 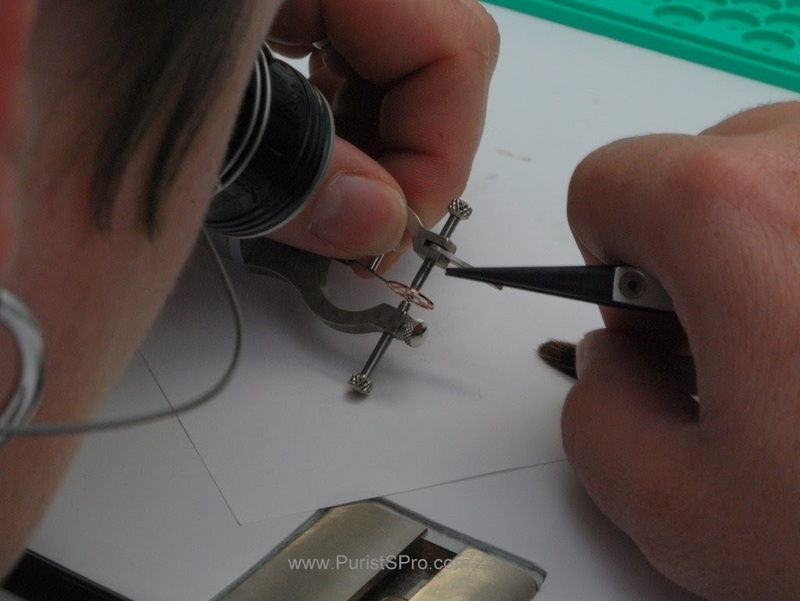 The manufacturing of this key component for wrist watches is almost completely monopolised by Nivarox. 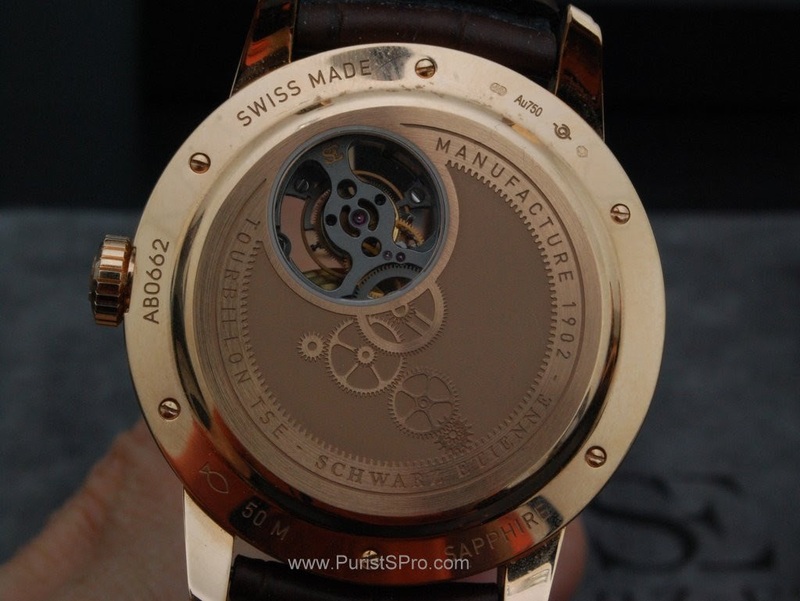 Being able to produce their own hairsprings makes them and their clients independent of the big watchmaking groups. 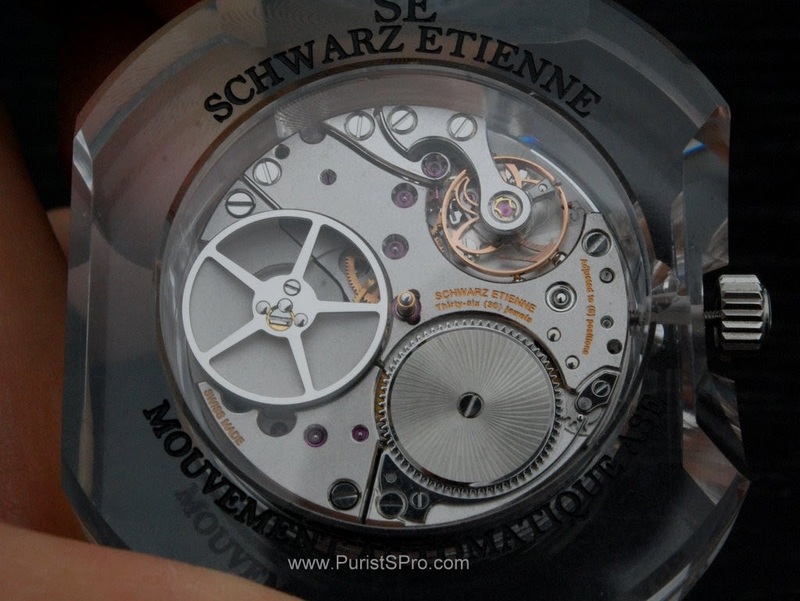 We will see some of this hairspring making activity in a minute, let's start, however with the Schwarz Etienne movements. We continue with the micro-rotor automatic movement which also includes the possibility to have power reserve indication and GMT. 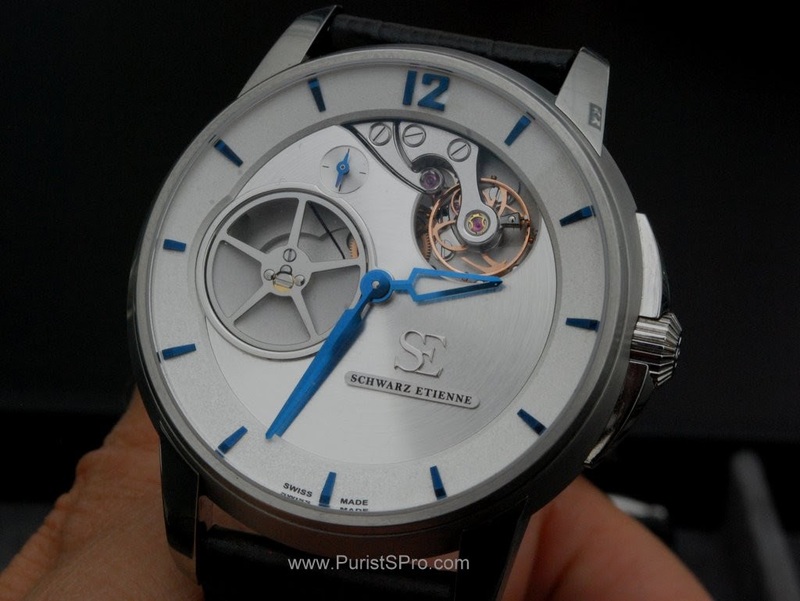 The “irreversable” movement is based on the micro-rotor movement, but with the hands on the bridge side. 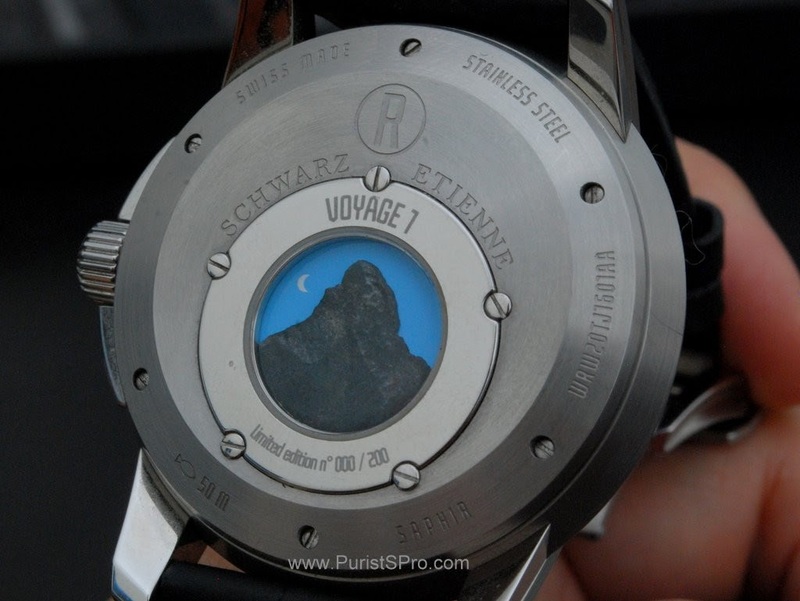 The Roswell Voyager model has a silhouette of the Matterhorn on the micro-rotor and on the case back a Matterhorn carving in serpentine stone from the Matterhorn. 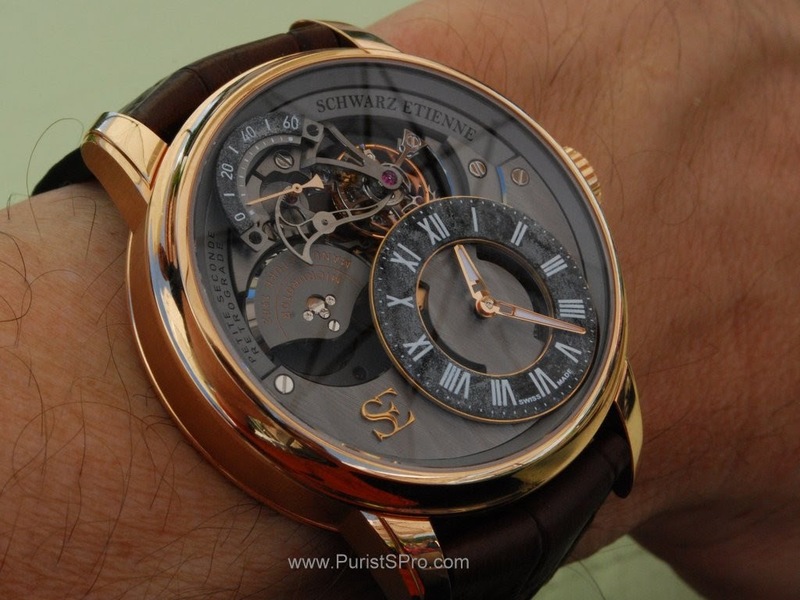 The flying tourbillon movement also has the barrel and micro-rotor on the dial side. 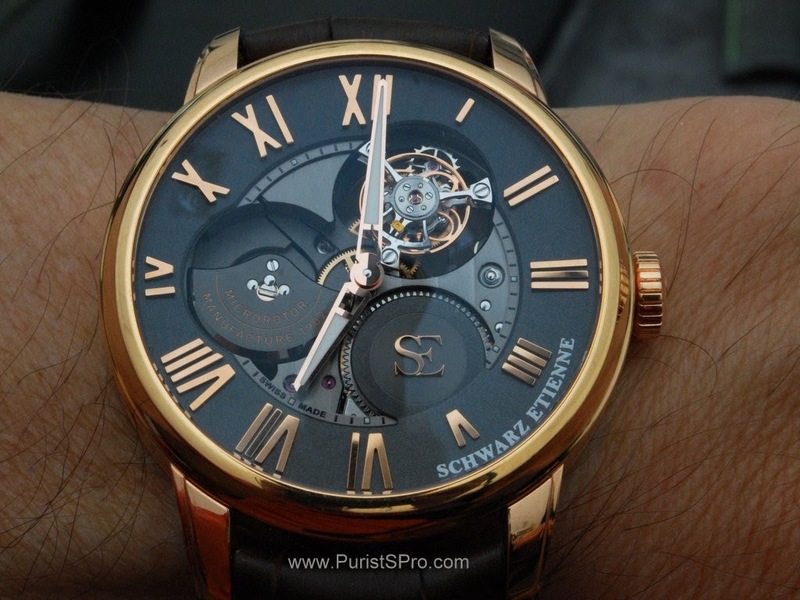 And finally, in my eyes the aesthetically most successful design, is the flying tourbillon with retrograde small seconds movement. 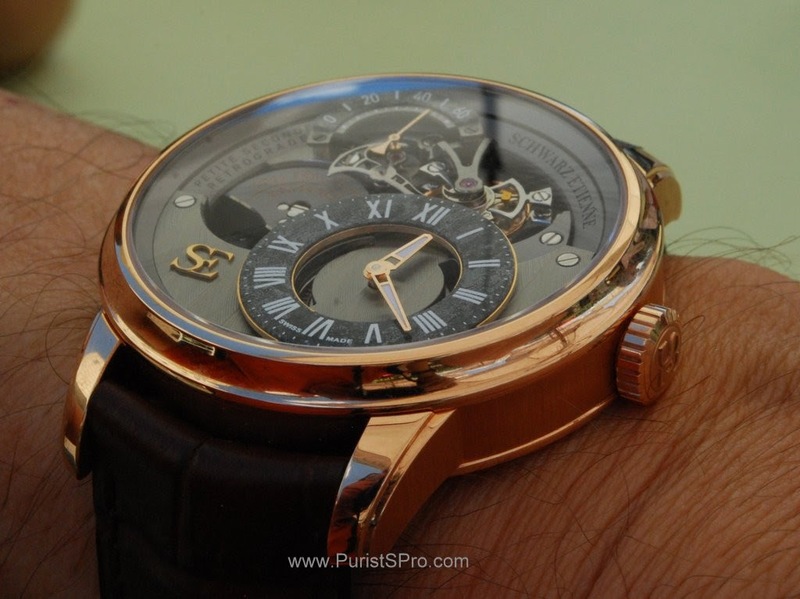 Note how the retrograge small seconds is driven directly from the tourbillon cage. 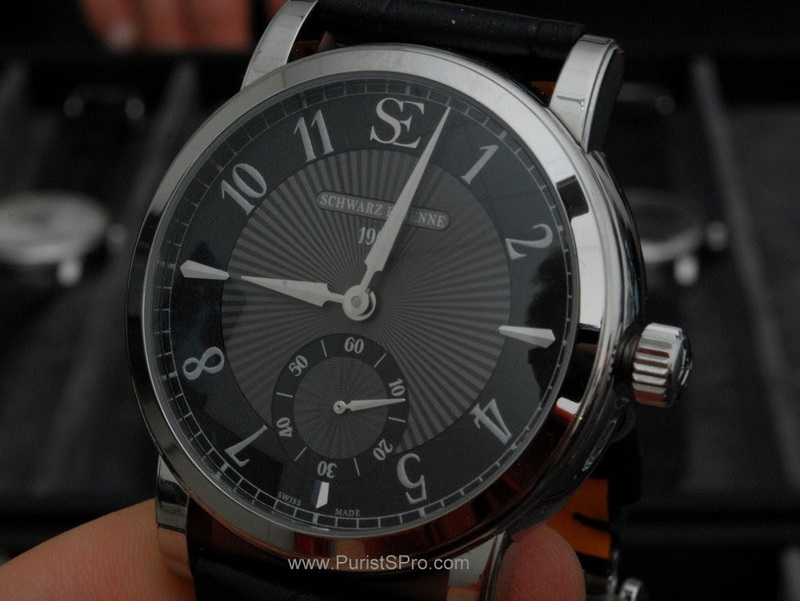 Now we have seen the movements and watches. Let's move on to see how they are made. 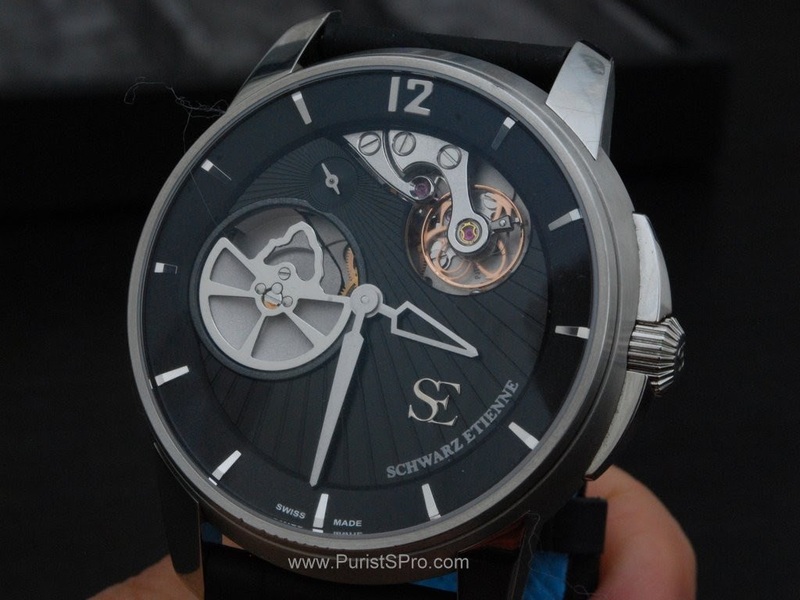 As a movement manufacturer Schwarz Etienne is well stocked with CNC milling machines and lathes, as one would expect. 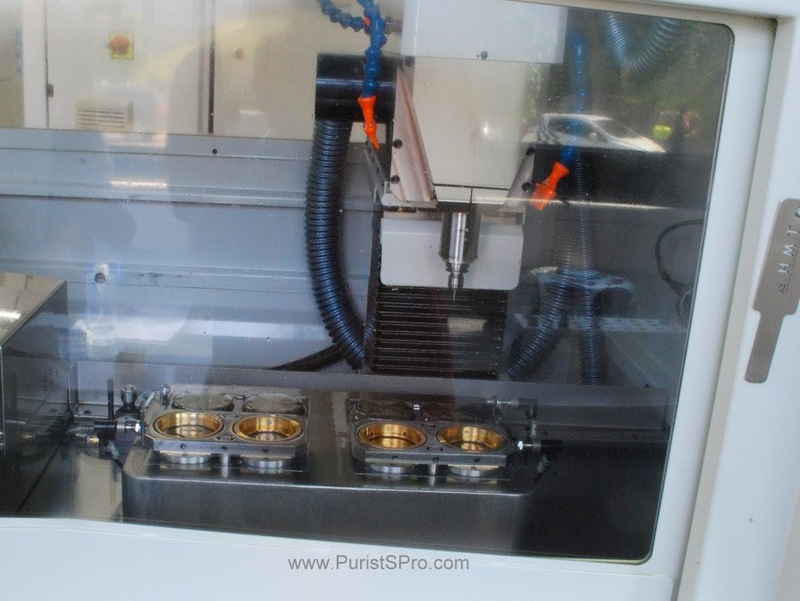 This milling machine has supports for 8 movement plates. 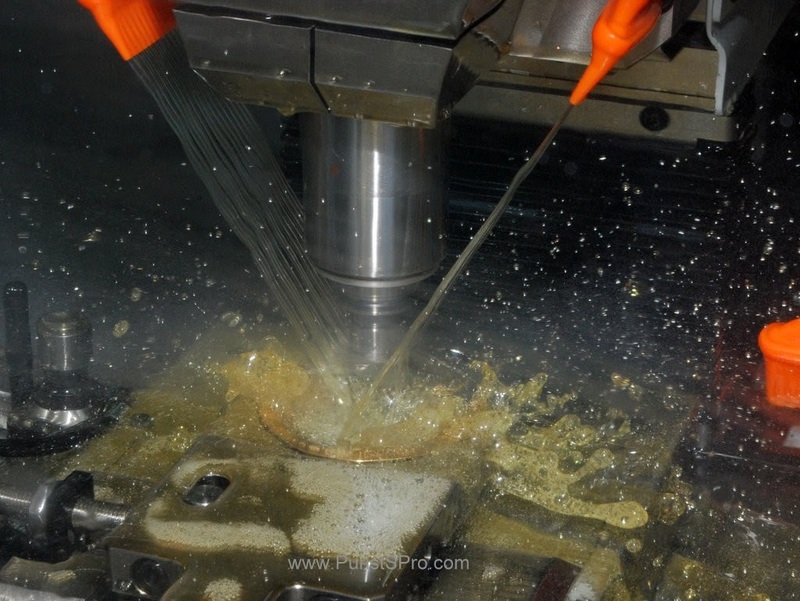 Milling a plate takes about 45 minutes so charging the unit with new material 3 times a day the machine works almost 24 hours a day. 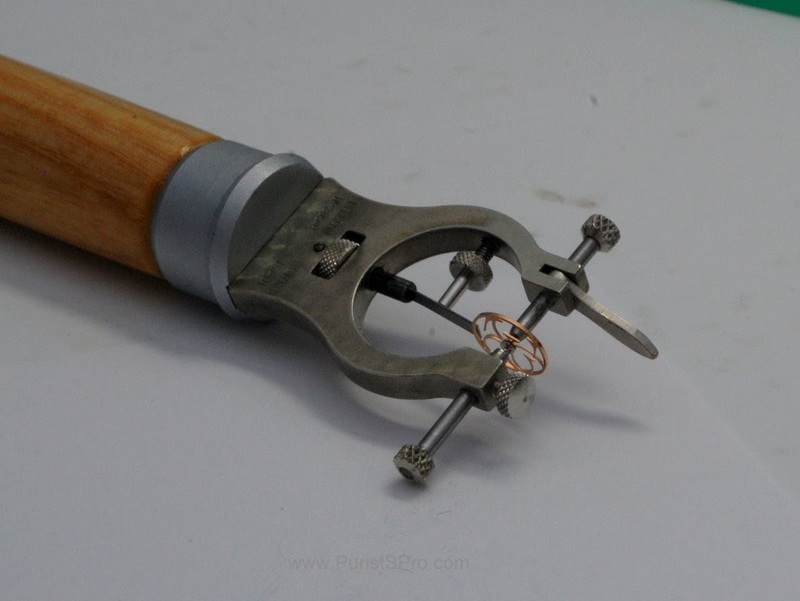 The Schwarz Etienne balance wheels are first turned on a lathe leaving the “plate” which will become the SE initials complete. 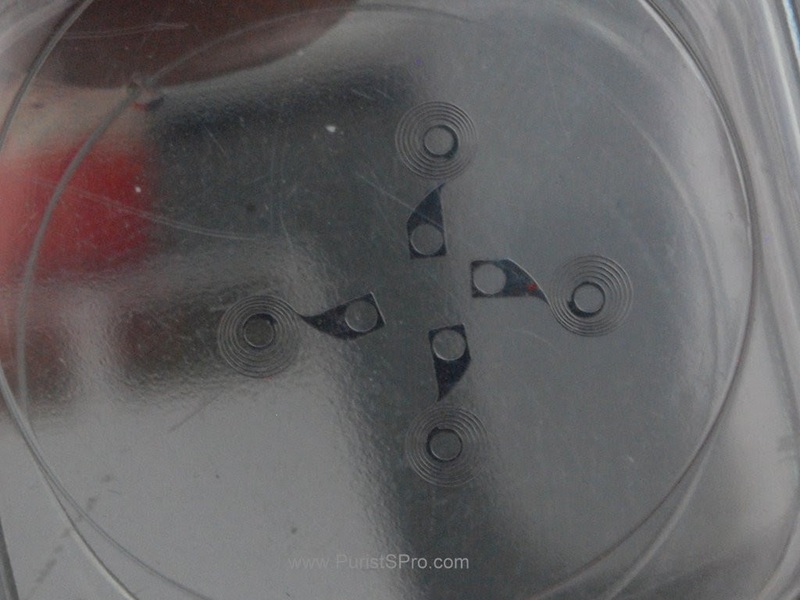 They are then cut using a laser. 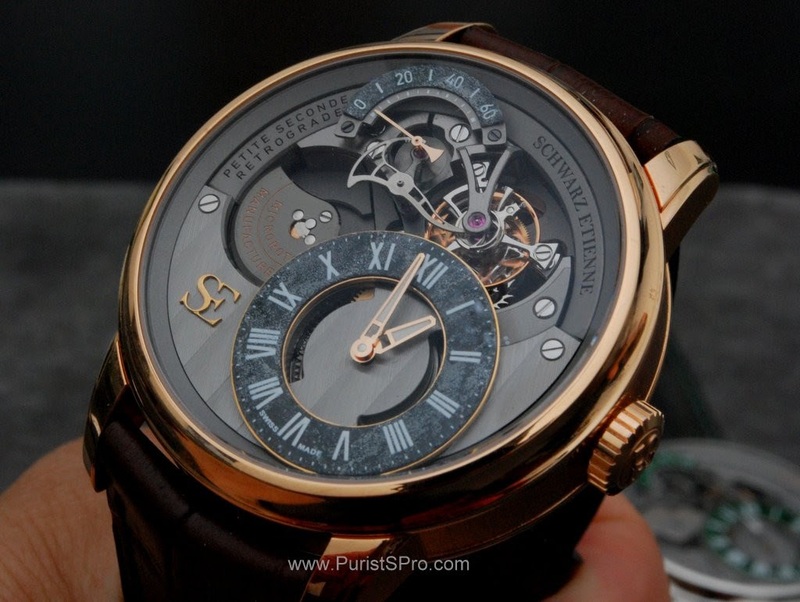 Of course the initials are designed so that the wheel remains in perfect balance. 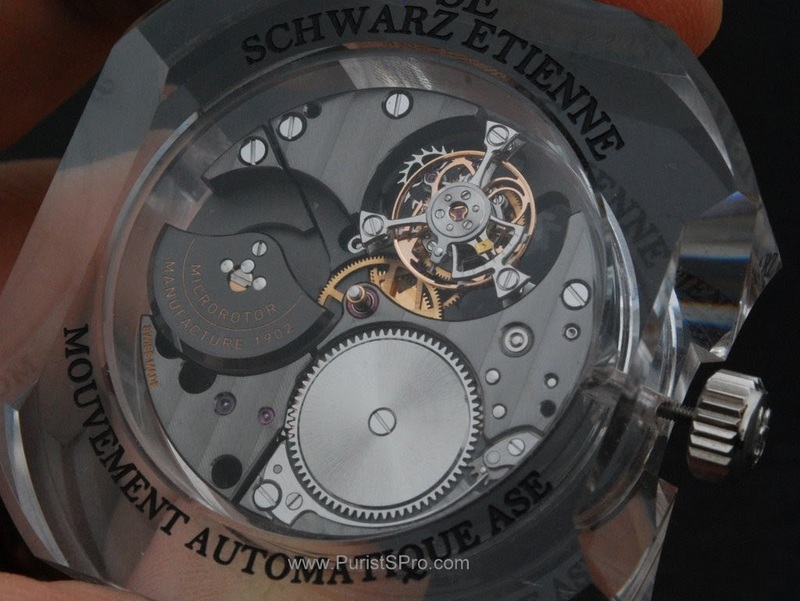 Schwarz Etienne also work a lot with CNC laser cutting. 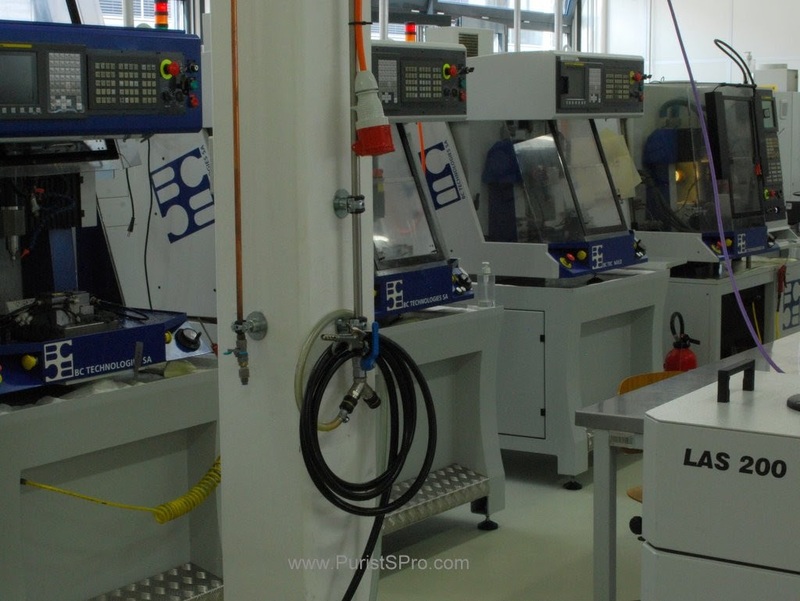 These machines have the highest precision and are used for making the escapement parts like the anchor and escape wheels. 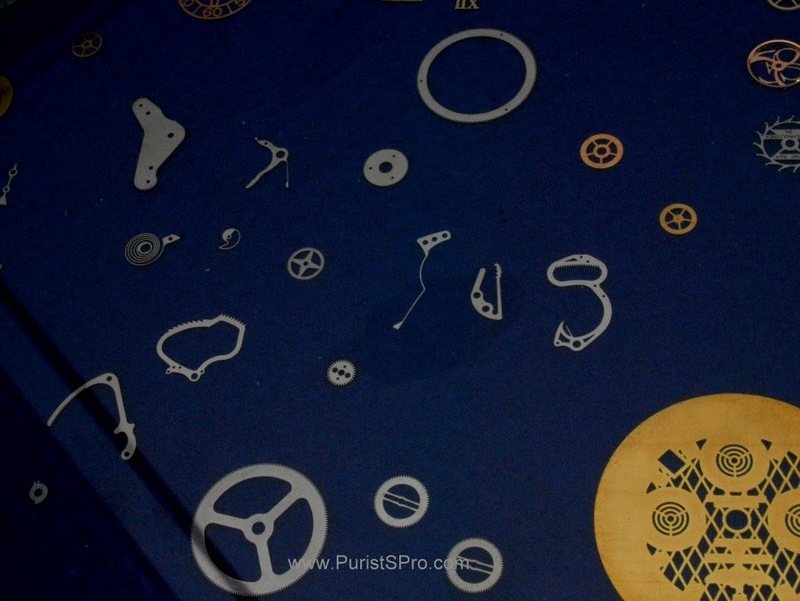 Some examples of parts cut using a laser machine. 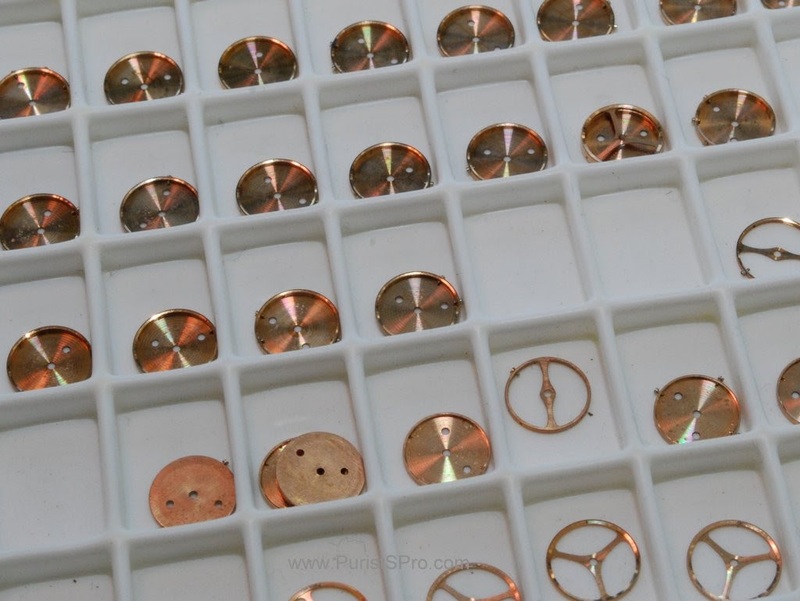 The “assortiment” of a watch movement includes the most critical parts such as the balance wheel, the anchor and the hairspring. 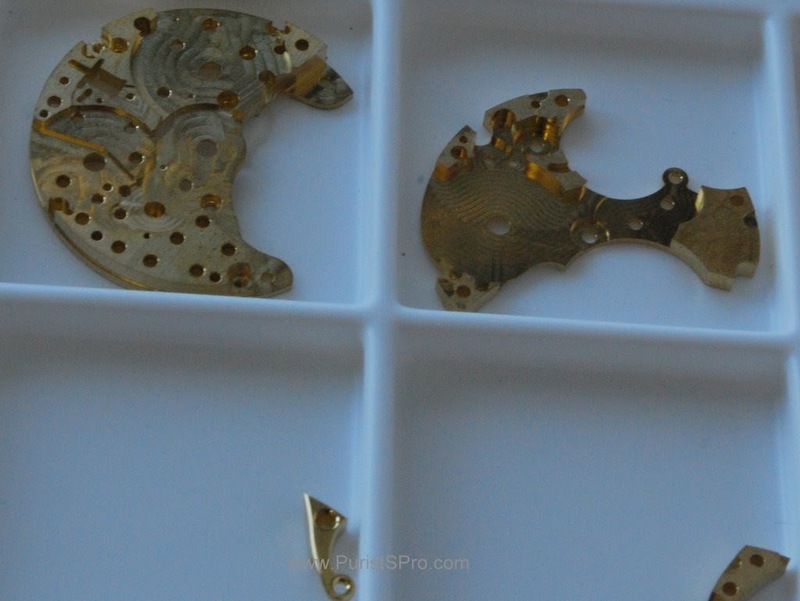 Historically these parts were made by different companies than the rest of the movements. 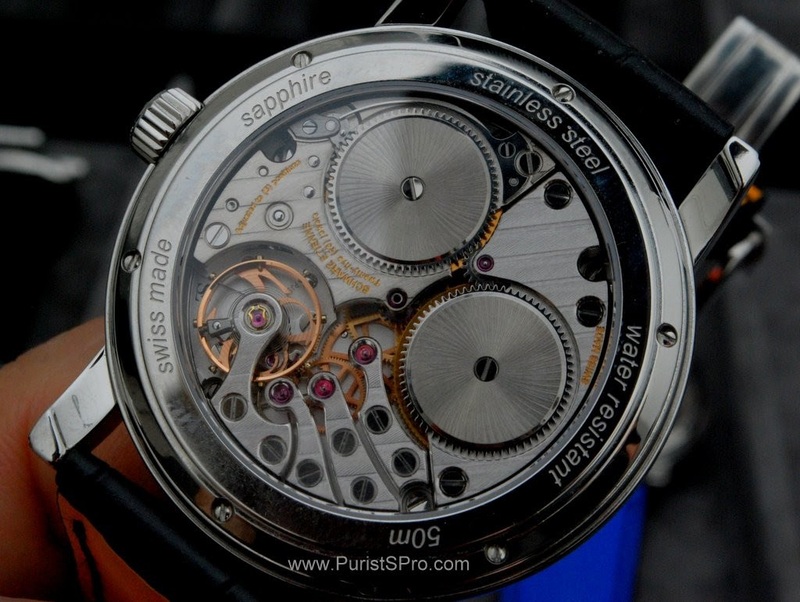 At the present the Swatch Group company Nivarox has a large monopoly on the market and supplies almost all the parts used in movements made in Europe. 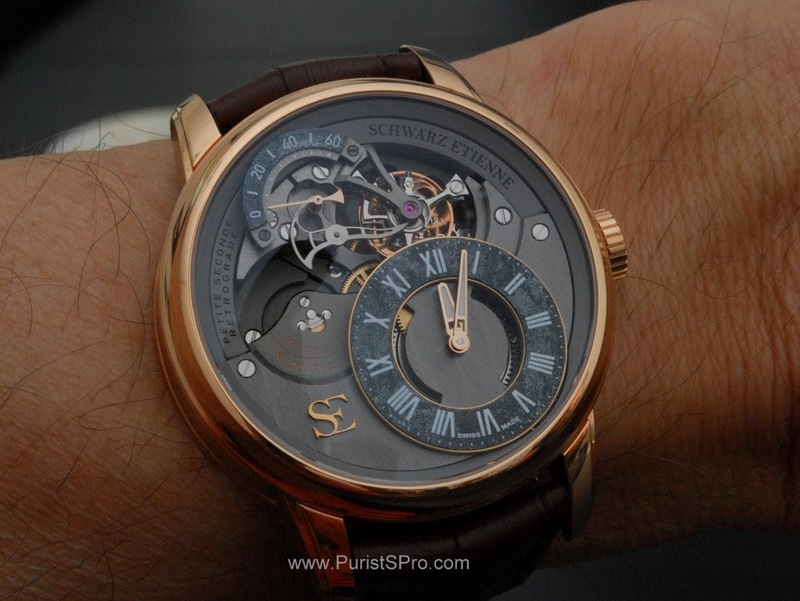 Schwarz Etienne founded their own company, E2Oinnovation, to make the assortiments for their movements and also for third parties. 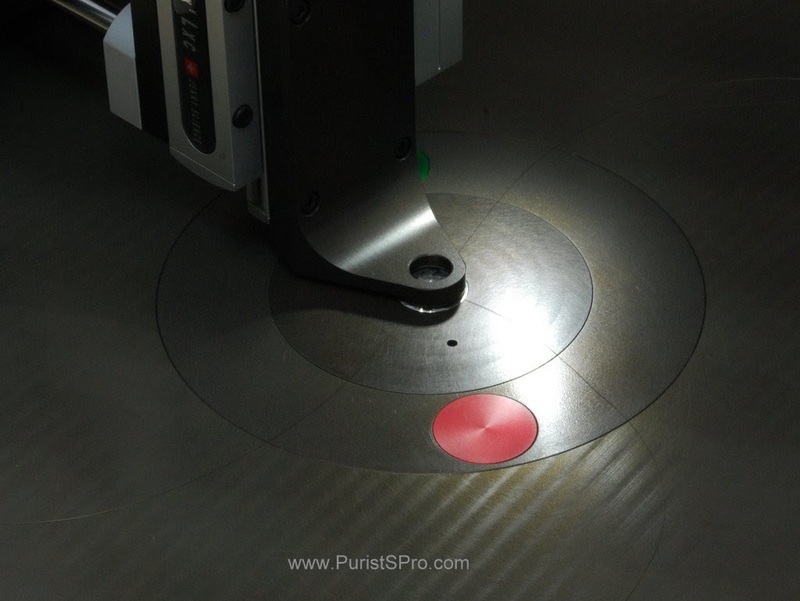 The flat parts such as the escape wheel and the anchor are cut using laser CNC machines such as the one shown above. 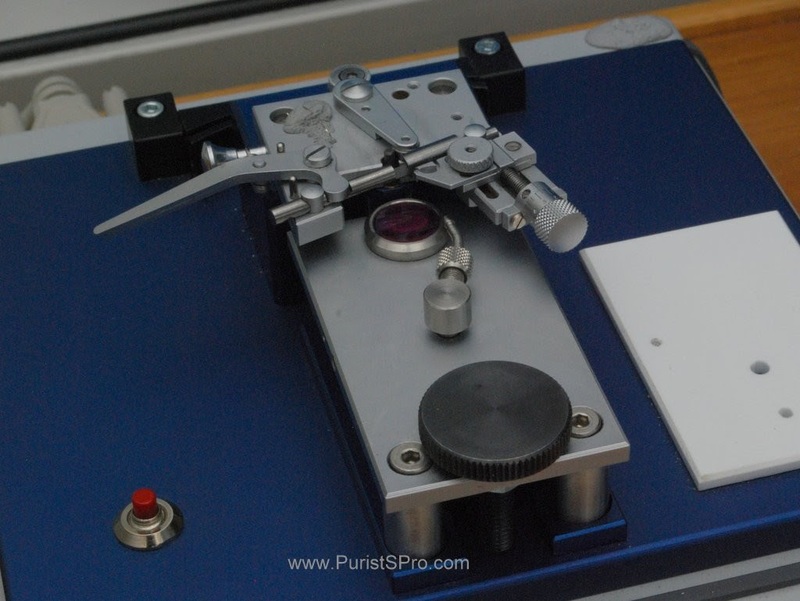 Here we see the laser at work, through the protective filter on the window we can hardly see the laser spot, a bright point at the lower left. That is the “cutting edge” where the work is done. 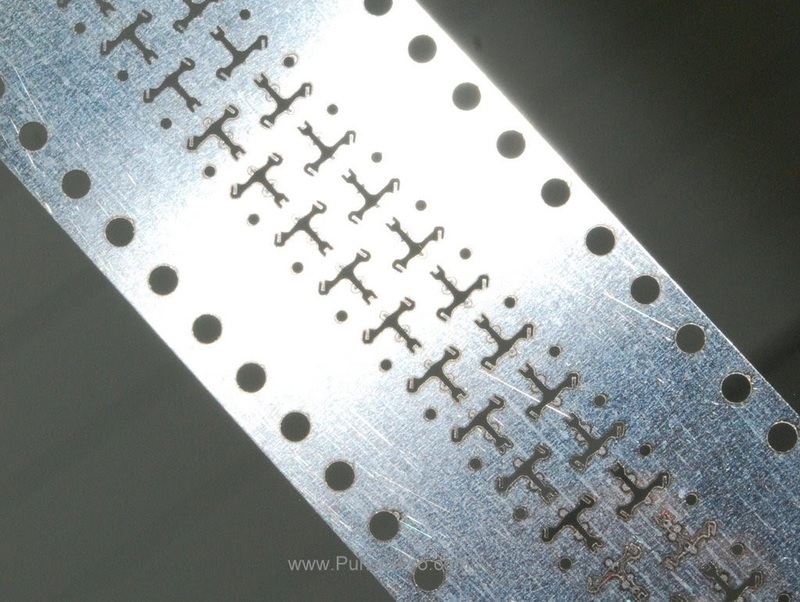 The parts are cut out of metal bands, here we see what remains after cutting out some anchors. Of course making the a complete part includes many operations such as riveting the wheels on the axle s etc. 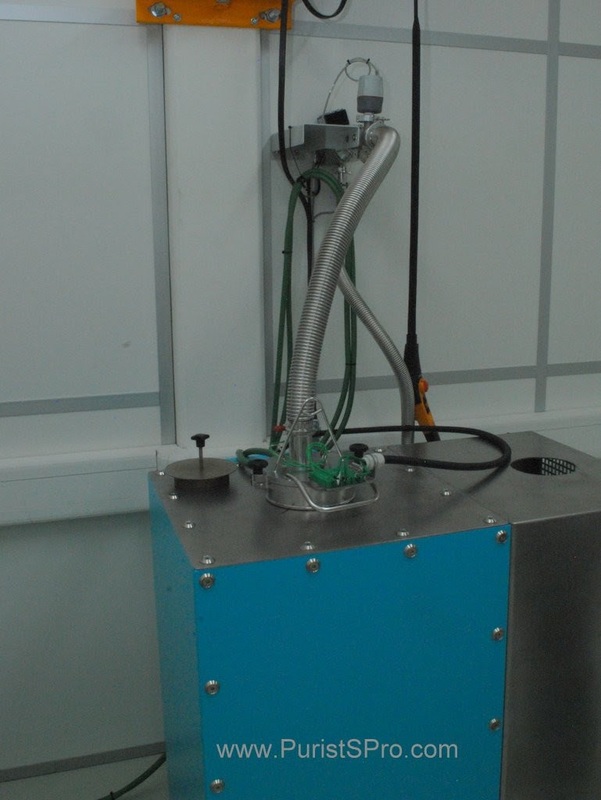 Here we see a special press used for inserting and riveting axles in wheels, the position and force used is monitored, essential for the quality control. Further controls are made with such a machine which measures the concentricity and flatness of a wheel mounted on its axle. For the general controls E2Oinnovtion also has the standard park of meteorological machines such as this one from Aubert. 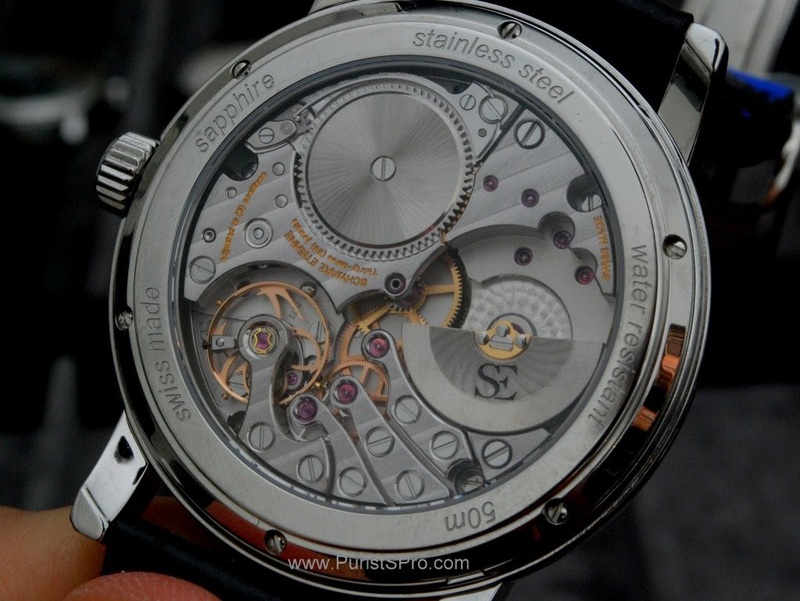 For many of the steps needed when making a hairspring, for example, they now use manual machines, as we will see. When the quantities warrant they will be automated. 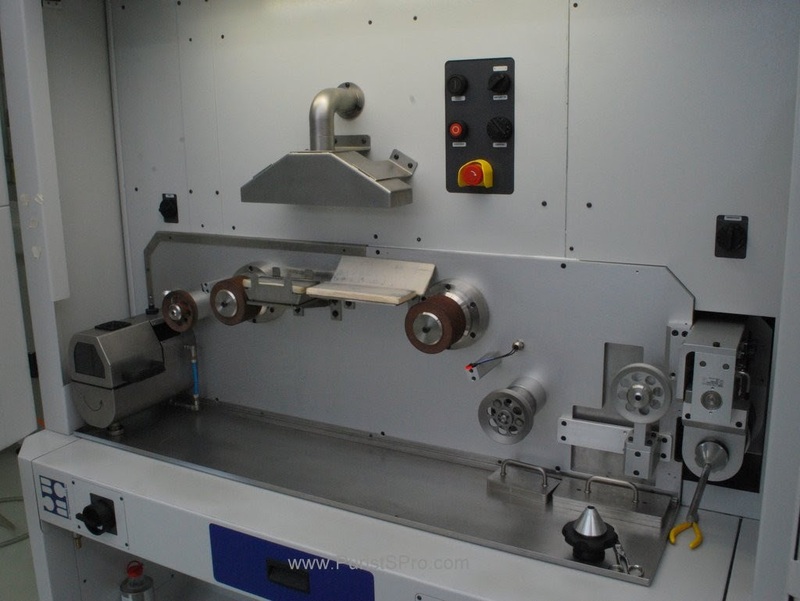 The following machine takes a hairspring mounted on a balance, tests its oscillating frequency and then cuts the spring to the correct length. 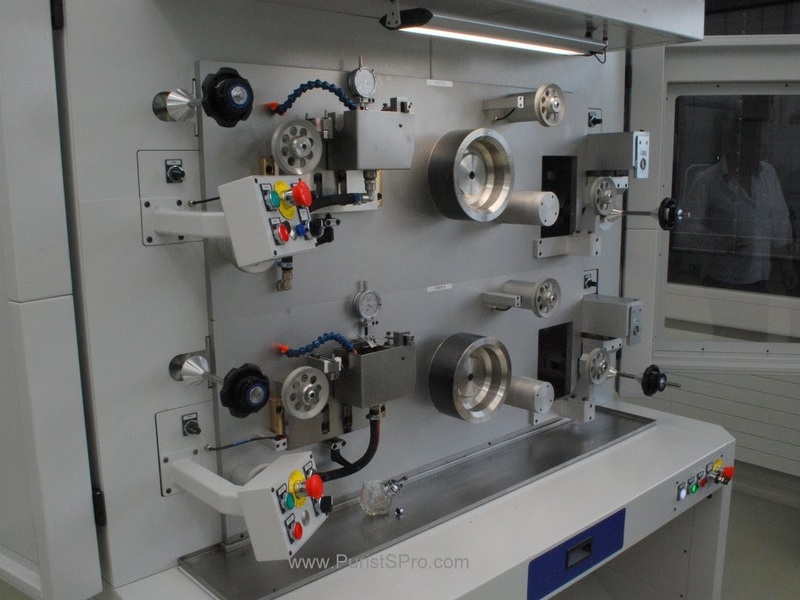 The following machine from Greiner is used to test the balance wheels and springs to classify them in groups so that when mounted they will have the correct oscillation frequency. 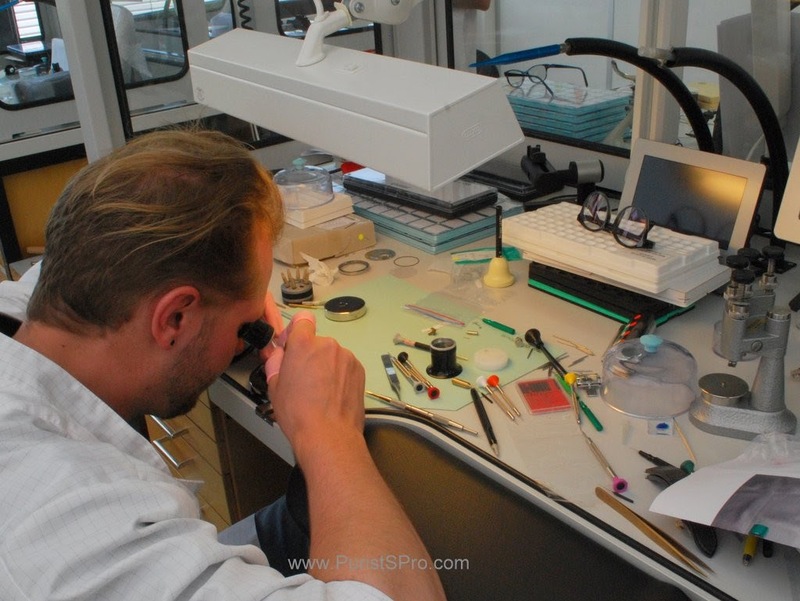 Of course Schwarz Etienne has the in house knowledge to do all this kind of work by hand for small quantities and special pieces. Here checking the flatness of a balance wheel. 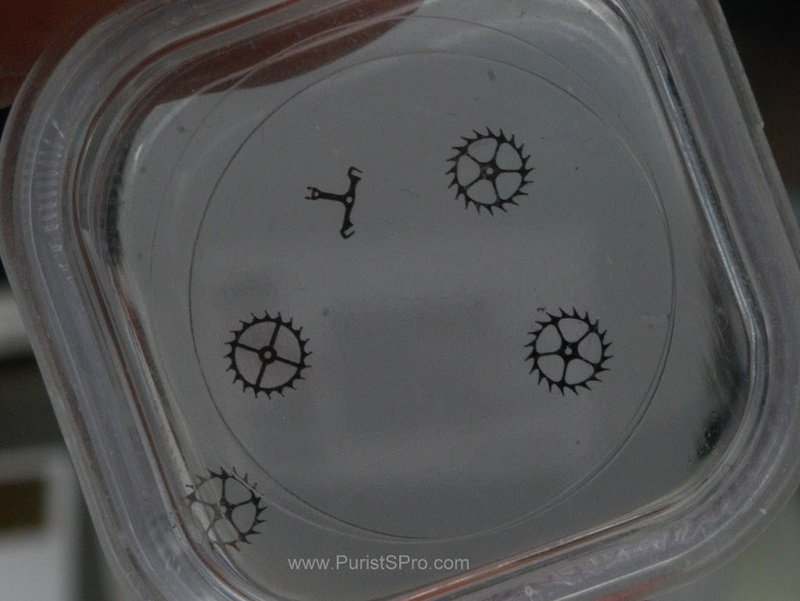 Now we move on to the heart of the oscillator, the hairspring. 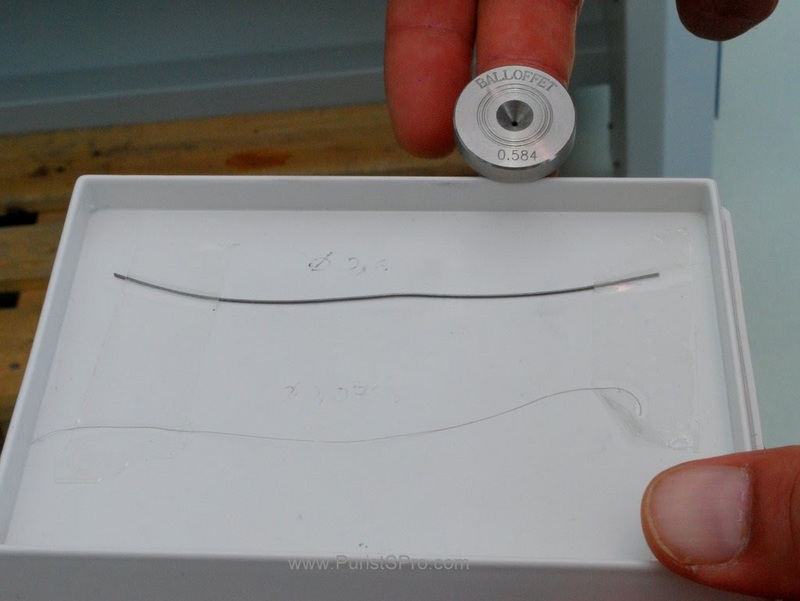 Here we see the raw material, a special steel from a top secret supplier in the form of a 0.6mm wire and the raw hairspring maerial after extruding and lamination, about 0.4mm by 0.065mm along with one of the extruding dies. 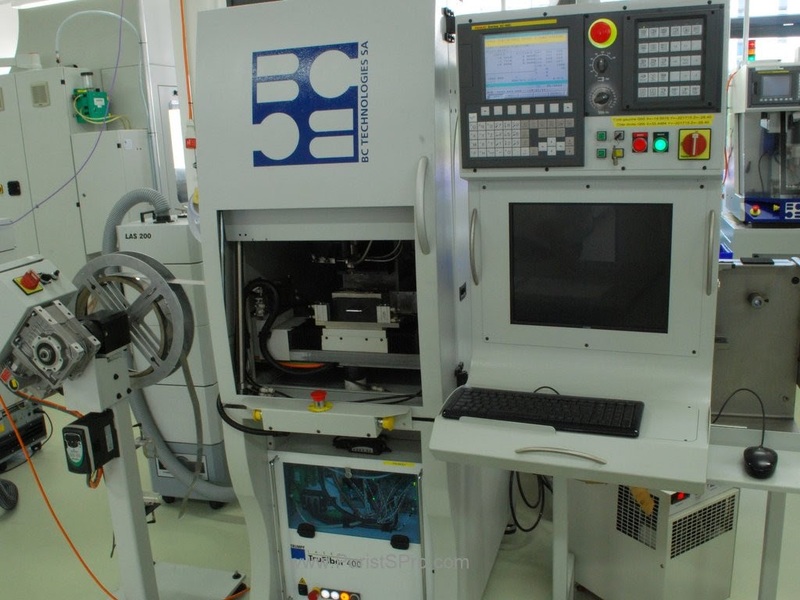 The wires are pulled through the die from the left to the right of this machine, about 40 times. Each time reduced the diameter a tiny bit. 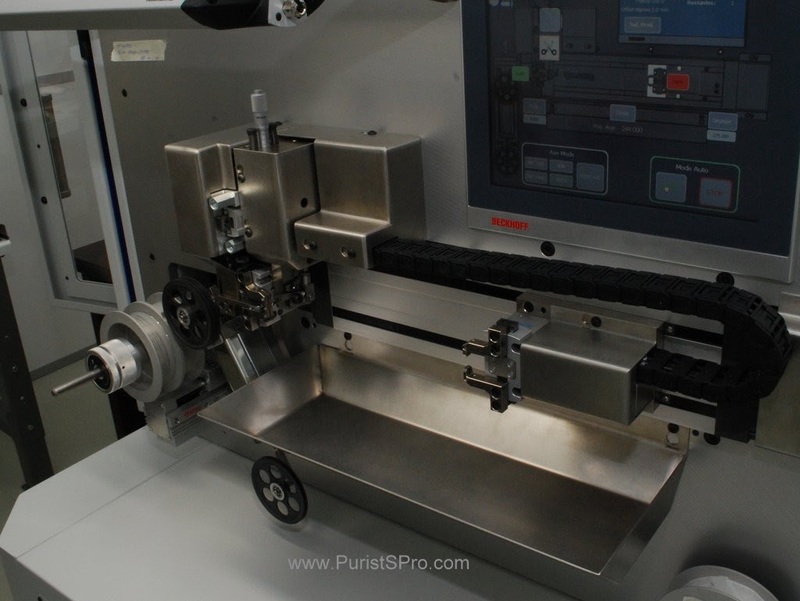 Between each extrusio step the wire is washed for its entire length on this machine. 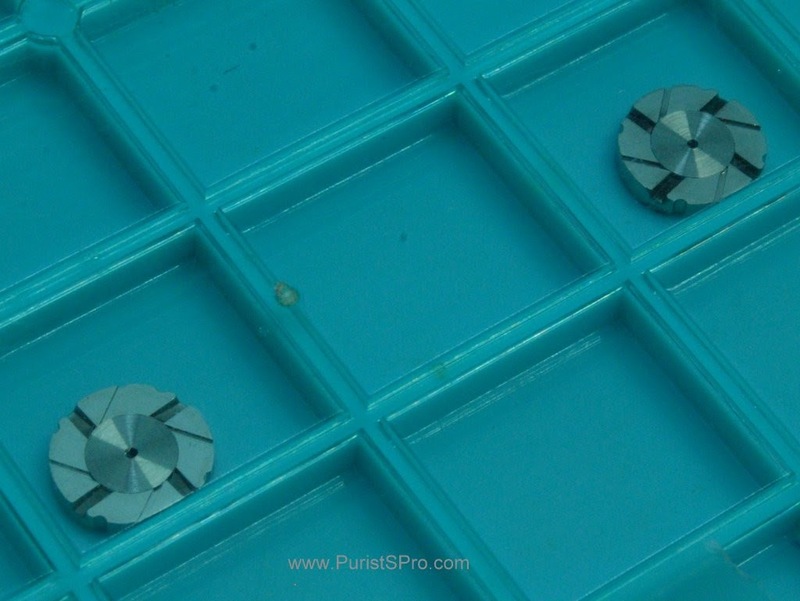 This is important to be sure that any burs or other irregularities that may form on the wire are removed and not re-pressed into the wire in the next extruding step. 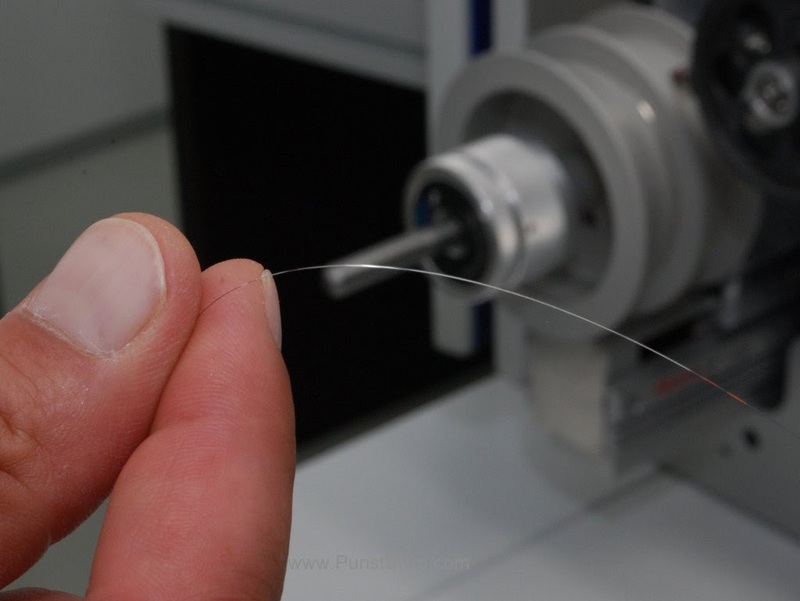 Once the wire has the correct diameter it is laminated to press it flat on this calendaring machine. 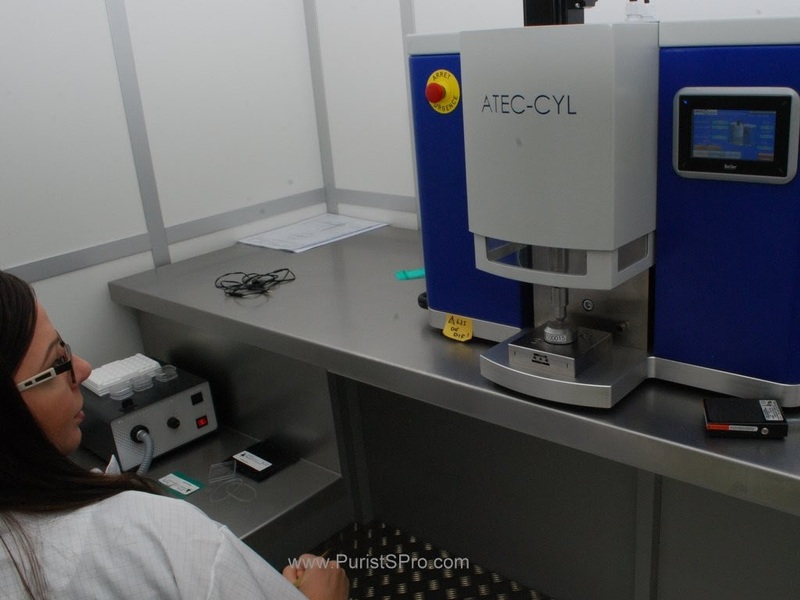 While working the thickness of the resulting material is measured and the rollers controlled to be able to arrive at a tolerance of 0.2µm (yes, 0.2 microns!!). 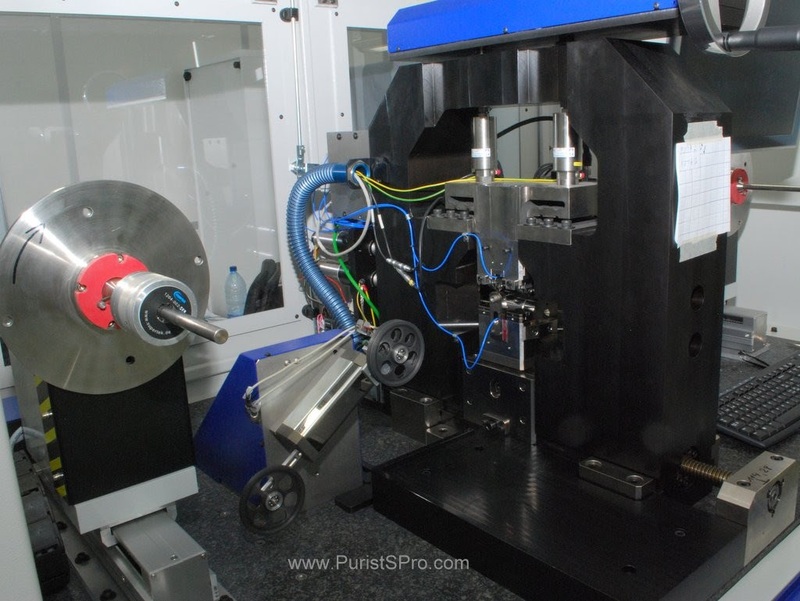 This machine automatically cuts the finished material to the needed length. 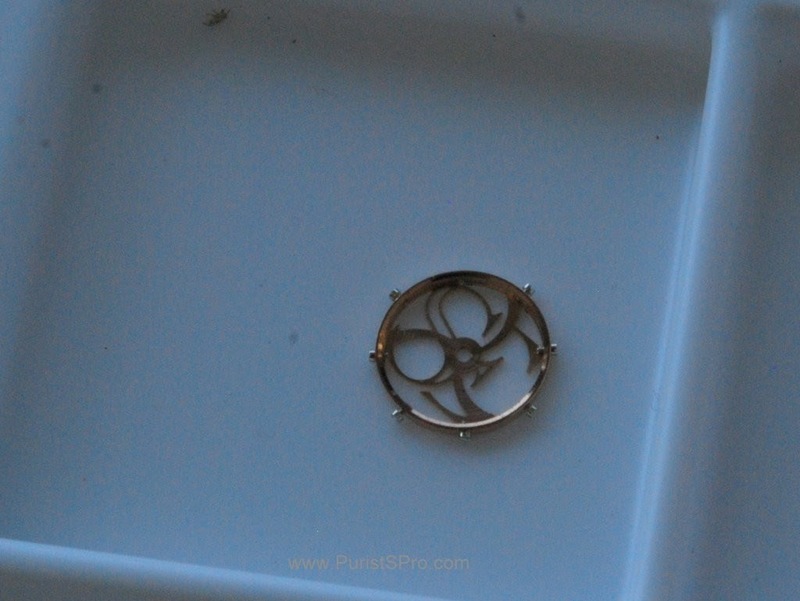 And this is what the finished hairspring material looks like. Next 3 or 4 of these wires are wound in a collar on this machine. Wound in the collar ready for the final heat treatment. 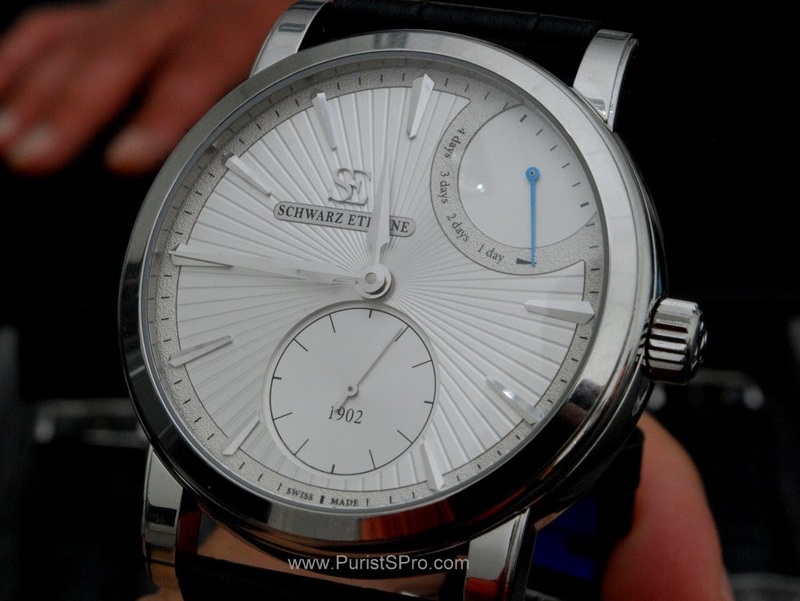 Critical for the final characteristic of the hairspring, its absolute elasticity as well as the elasticity change over temperature, is the heat treatment, of which one doesn't learn very many details, except that it is done in this oven at somewhere between 200°C and 500°C. 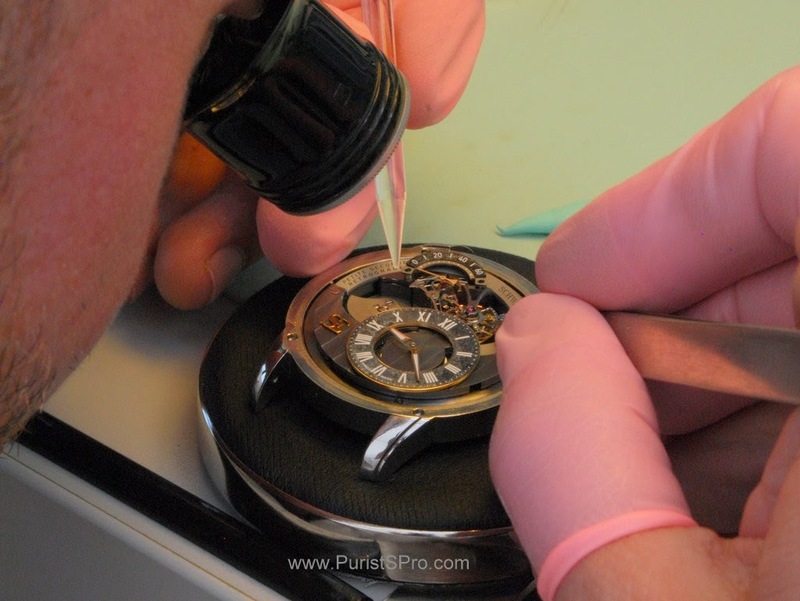 Now let's move to the watchmakers atelier, final checks of a retrograde second flying tourbillon. 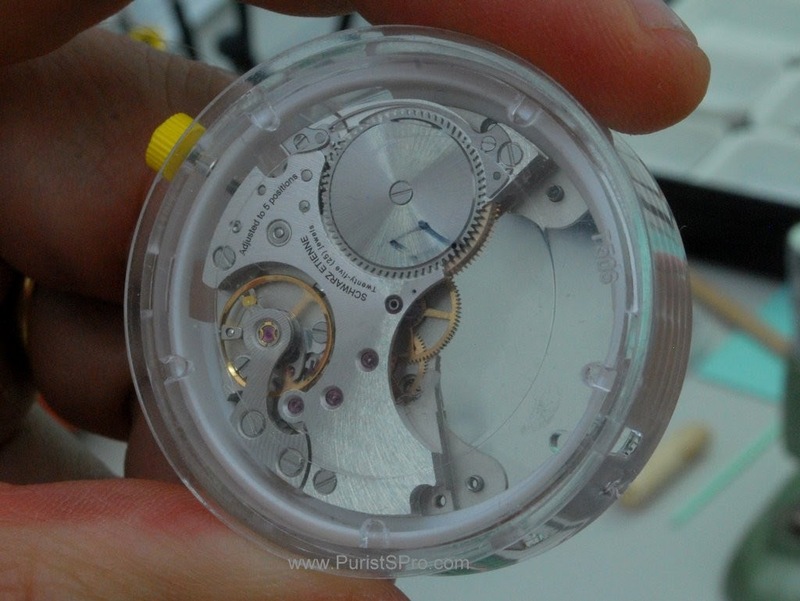 Assembly of the micro-rotor 3 hand movement. 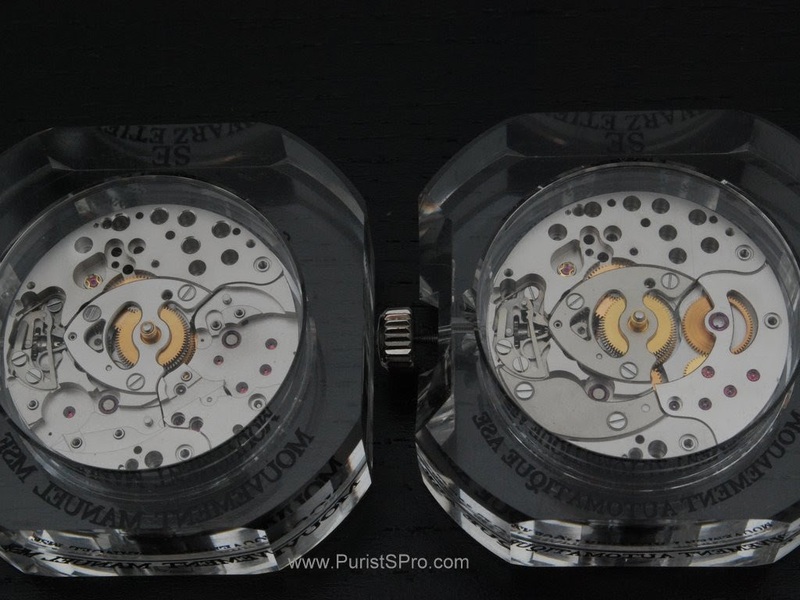 Here a peak at the 3 hand movement as it is supplied to 3rd party customers. 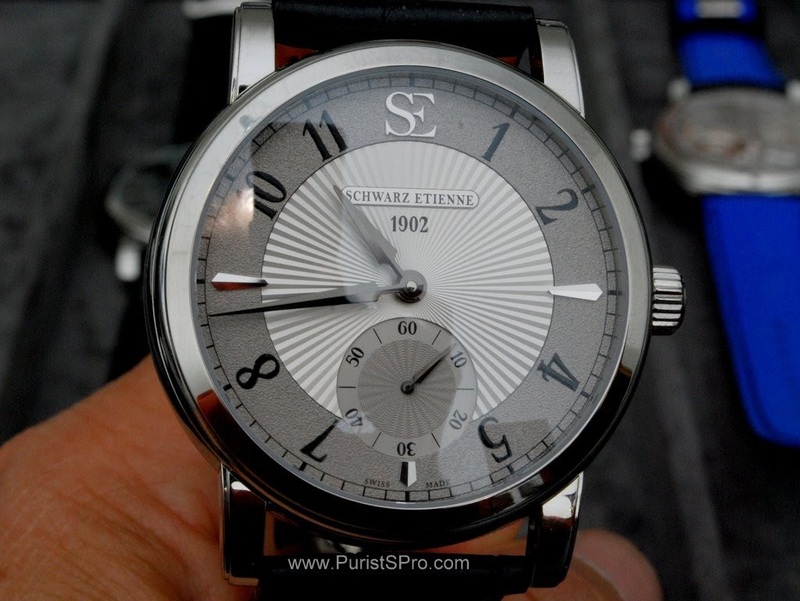 I would like to thank the team at Schwarz Etienne for their warm welcome and the very informative visit to their shops. I am sure that we will be hearing more from these people in the coming years. I hope you have enjoyed this visit as much as I did. WOW! Thank you Don for this incredible and deeply report and all these shots. Wow, thanks for sharing. I've never heard of them before. 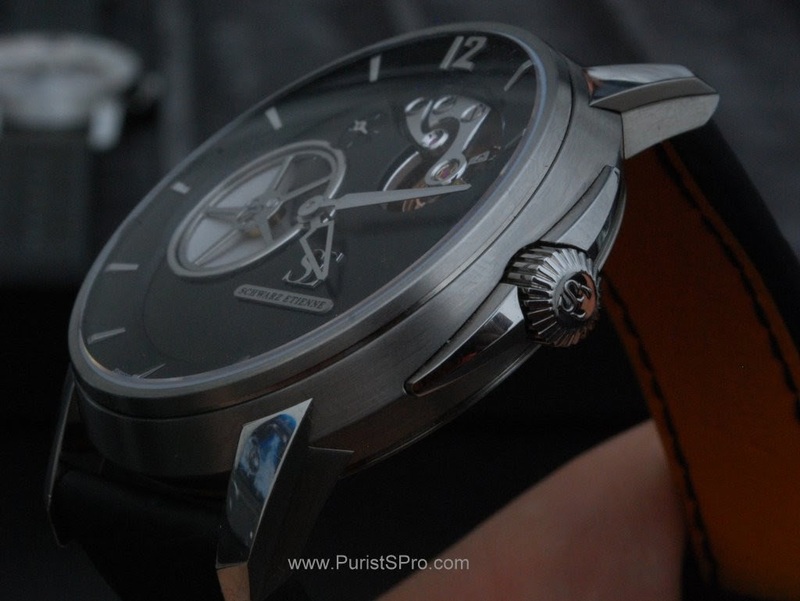 Thanks a lot Don for this great report!